Amy Gillen (pictured centre), a student at Royal College of Music (RCM) in London, is the recipient of the 2018 Irish Heritage Music Bursary for Performance. The prestigious Bursary is an important part of the arts organisation’s annual programme of activities, concerts and recitals. Twenty-three-year-old Amy, who comes from Bridgetown in County Donegal, was awarded a first class honours BA of Music Performance in Flute from the Royal Irish Academy of Music earlier this year. She moved to London in September to study for a Masters of Music Performance in Flute at the Royal College of Music. Amy’s exceptional talent has already been recognised through the award of multiple prizes both in Ireland and further afield. Earlier this year, she gave a recital at the Galway International Flute Festival as part of being awarded the prestigious Sir James Galway Rising Star Award at the same festival in Switzerland in 2017. There already are two confirmed opportunities where Amy will be performing in an Irish Heritage context. 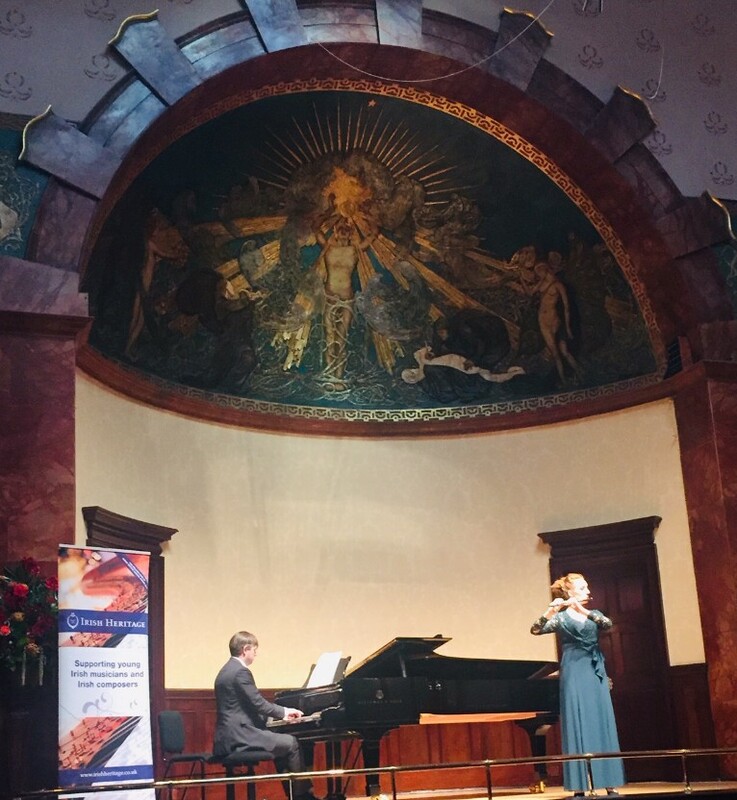 She will give a recital at the organisation’s bursary winner’s concert in the beautiful St Marylebone Parish Church on Marylebone Road, London NWI on Wednesday 6th March 2019. Amy will also perform at the Blackwater Valley Opera Festival in Lismore County Waterford on 31st May 2019 together with the two highly commended contestants for this year’s Bursary, tenor Peter Harris from the Royal Academy of Music, and harpist Tara Viscardi from the Royal College of Music. Brian Hughes, a pianist studying at the Royal College of Music was awarded a special prize to perform as an accompanist at the Blackwater Valley Opera Festival. 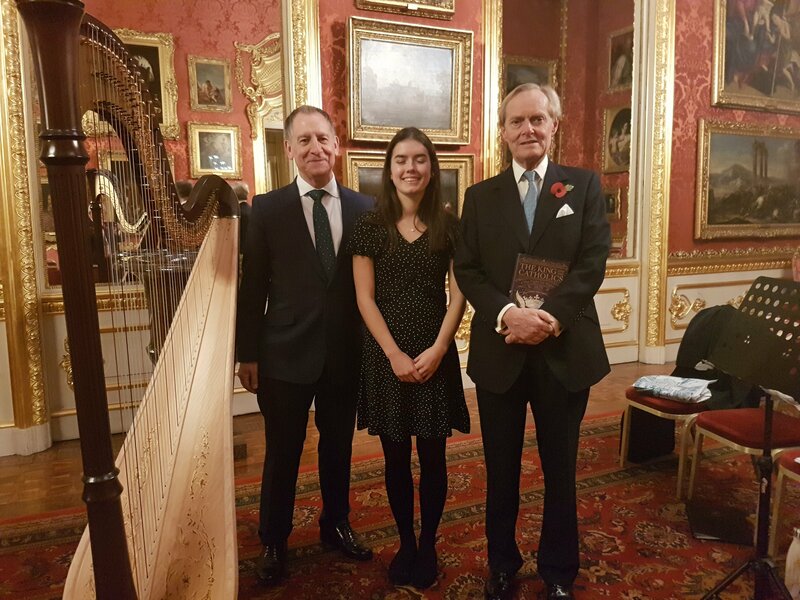 Irish Heritage was proud to support the Embassy of Ireland on 31st October by providing the music at the launch of Lady Antonia Fraser’s new book, “The King and the Catholics – The Fight for Rights” at Apsley House, the London home of the Duke of Wellington, on Hyde Park Corner. 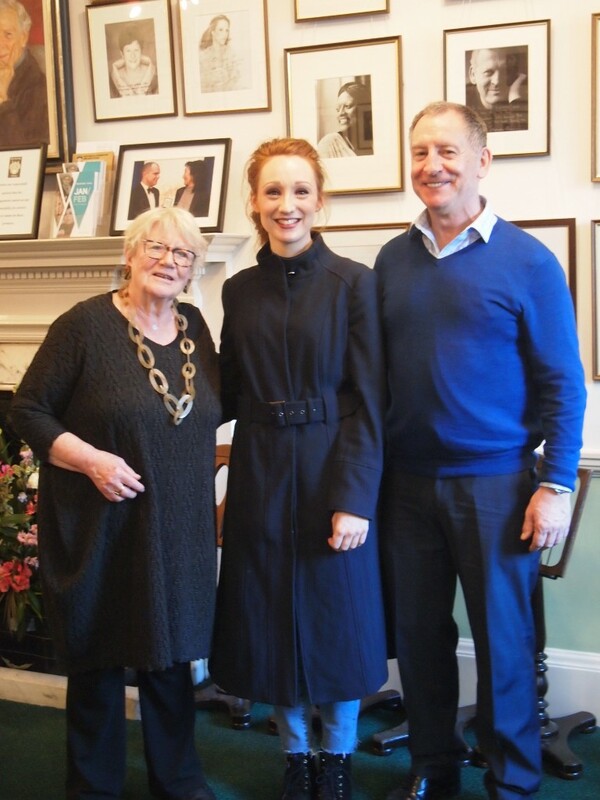 His Excellency, Ambassador Adrian O’Neill, introduced Maria McNamee, (harpist and runner-up in the 2017 Irish Heritage Music Bursary), and Joe Corbett (baritone and Irish Heritage’s artistic adviser-Britain), who performed melodies by Thomas Moore that were originally composed during the time covered by Lady Antonia’s book. Maria and Joe’s performance earned enthusiastic applause from the audience and the personal thanks of the Ambassador and Mrs O’Neill and the Duke of Wellington. “Christmas by Candlelight” is now established as one of Irish Heritage’s most popular events and a part of the build-up to the Festive season for many people. This year’s concert takes place once again in St. George’s Hanover Square in the heart of the West End on Wednesday 19th December at 7.00pm. Handel’s Church as it is also known, was refurbished in 2010 and provides an appropriate ambiance for Irish Heritage’s seasonal concert. This year’s programme of popular Christmas Carols and seasonal music features the welcome return of The Arb Ensemble under the direction of Jonathan Darbourne, which was a highlight of the 2016 concert. They will be joined by mezzo-soprano Jessica Costelloe, baritone Jamie Rock and accompanist Tracey Symon with guest readers His Excellency Adrian O’Neill, Ambassador of Ireland, Angela Brady OBE and Petroc Trelawny from BBC Radio 3. The audience will be expected to enthusiastically join in the carol singing! Tickets are £20 each for adults (including wine reception and programme) and £5 for students on production of ID. Adult tickets are only available online via the Irish Heritage website (www.irishheritage.co.uk), there are no booking fees. Student tickets are only available on the door on the evening and are subject to availability. Irish Heritage has appointed two Artistic Advisers, one for Britain, the other for Ireland who take up their roles immediately. Audrey McKenna and Joe Corbett have accepted invitations from the Board of Irish Heritage to become the organisation’s Artistic Advisers for Ireland and Britain respectively. Both are current music industry professionals. 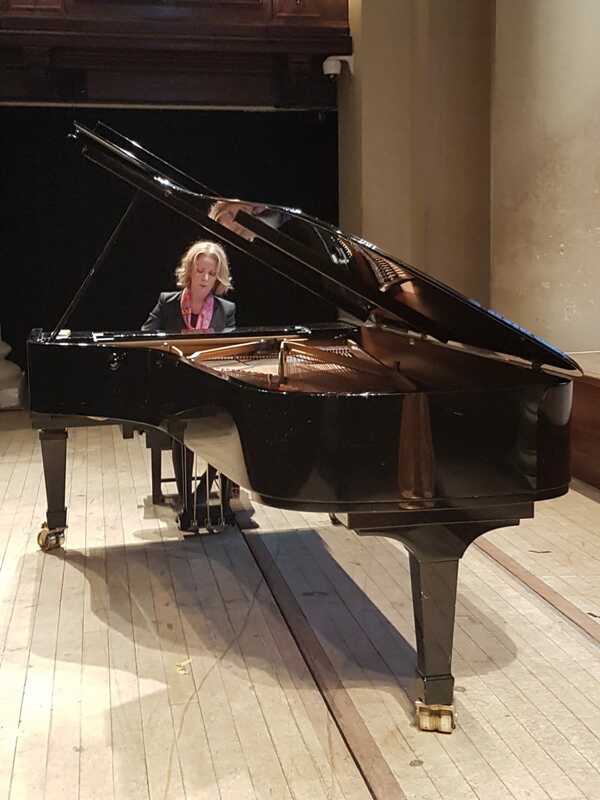 Audrey McKenna has a comprehensive background in classical music composition and performance and is Founder and Director of the Kingston Academy of Music in Dublin. Joe Corbett is a London based, professional singer (baritone) and teacher who has performed extensively in this country, Ireland and Europe. Announcing the appointments the Chairman of Irish Heritage, Patrick Lennon said, “The demand from young Irish performers and composers for support in the early stages of their careers continues to increase. If Irish Heritage is to continue to fulfil a worthwhile role and provide the opportunities they need, then we have to have advice and guidance on current trends and identify the young performers that can benefit from our bursaries, collaborations and events. Irish Heritage’s patron John Gilhooly has received the Austrian Cross of Honour. A Limerick native, Mr Gilhooly is Director of London’s Wigmore Hall concert venue and Chairman of the Royal Philharmonic Society. He had the Austrian Cross of Honour for Science and Art bestowed upon him by the President of Austria’s representative Dr Martin Eichtinger, the Austrian Ambassador to the Court of St James, at a ceremony at the end of September. The award is for ‘superior creative and commendable services in the areas of sciences and the arts’. It was created by federal law in 1955 and honours Austrian or leading international figures that have “distinguished themselves and earned general acclaim through especially superior and commendable services in the areas of the sciences or the arts”. Mr Gilhooly became Director of the Wigmore Hall in 2005, making him, then, the youngest leader of any of the world’s great concert halls. He has overseen the artistic, financial and administrative transformation of the Hall resulting in record box office returns and the Hall’s highest ever membership levels and annual fundraising. By becoming a Friend of Irish Heritage you join a special community of people who are committed to making the dreams of young Irish classical performers and composers a reality and to helping maintain the high quality and breadth of our programme of concerts and other events. Your subscription provides vital funding for the essential support and performance opportunities Irish Heritage is able to offer talented musicians, singers and composers that are awarded Bursaries or are identified by Irish Heritage’s artistic advisers. For further information and an application form, please visit: www.irishheritage.co.uk and click on the “Join Us” tab. Without the generosity of our Friends, much that we do at Irish Heritage would be impossible. It is the only Irish arts organisation in Britain dedicated to helping young Irish musicians and composers in the early part of their career when their need is greatest. It awards two valuable Bursaries annually, one for performance, the other for composition.